What is Push-to-Talk? According to Wikipedia, Push-to-Talk or press to transmit is a method of having conversations or talking on half-duplex communication lines, including two-way radio, using a momentary button to switch from voice reception mode to transmit mode. As many good things, first it has been an army technology and now it’s just everywhere. What does it mean for a simple smartphone user? 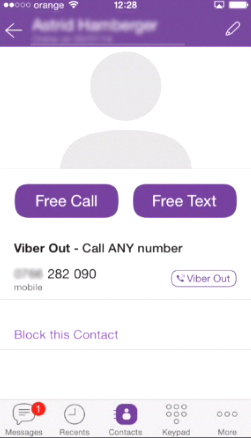 If you have an iPhone and Android with a free Viber app installed on it, you can profit from sending your voice message to another user using Viber on mobile phone even without having an actual active phone conversation and simultaneous connection. Let’s say your friend is somewhere in metro station so you cannot talk due to interruptions on his or her line? Fine. 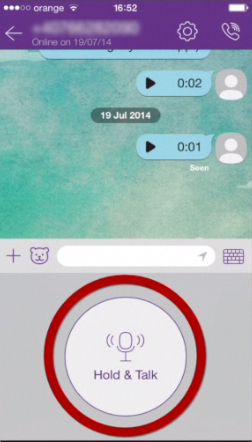 Use “Push-to-Talk” feature and the recorded audio-sentence will be played by your friend whenever it’s possible. Step 1. Practically it works like…well let us get our iPhone and show it to you. Open your Viber app. 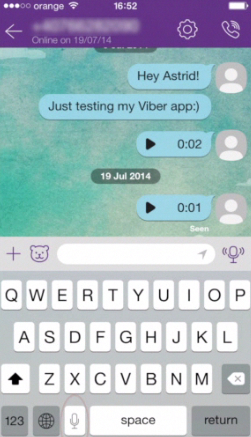 We have shown how to use it in “How to make free phone calls with Viber” tutorial. Step 2. 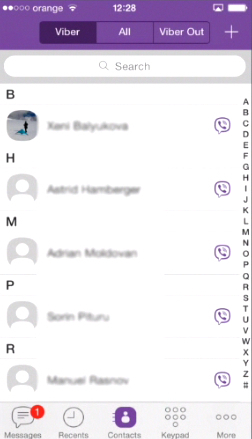 Tap “Contacts” at the bottom of your Viber menu. Step 3. Choose the friend who has Viber on his or her mobile phone. Tap “Free Text” button to initiate a conversation. Step 4. Tap the little microphone icon on the right of the “Compose” field. Step 5. Press and hold the “Hold & Talk” button. Start speaking, but keep your audio message less than 30 seconds. Step 6. When you finish and let your “Hold and Talk” button go, two different things may happen. If your friend has the “Hold and Talk” mode active, the message will be streamed to him or her right away. If this mode is not open, the message with a little play button will be added to your chat and your friend will be able to play it whenever it’s possible. Result: That’s it. Use “Push To Talk” anytime you need to voice talk, but cannot call your friend. Have fun using Viber!